Donna and Roe welcome you to our office! 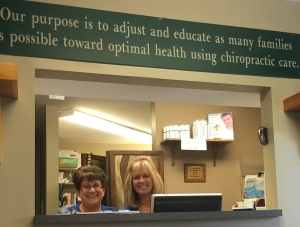 You’re warmly welcomed to the pleasant, positive environment at Casper Chiropractic. Our upbeat team strives to provide a healing environment and is always happy to see you. Your time is valuable, so we pride ourselves on efficient health care without long wait times. We stay flexible with scheduling so that you can easily fit your appointments into your day. Donna or Roe at the front desk will be ready to greet you when you walk in. The paperwork we ask you to complete can be found on our website and brought in completed, or we can assist you with it when you arrive. You’ll watch a short video about chiropractic, then see Dr. Casper. Today’s visit consists of gathering the information we need to determine the cause of your problems and how best to help you. The examination we perform includes an orthopedic, neurological and structural evaluation. X-rays are taken, and then we’ll schedule you for your next visit. Dr. Casper offers X-ray’s onsite. After your initial appointment, you’ll receive a report of Dr. Casper’s findings once we’ve determined how you respond to chiropractic care. Our future recommendations are based on your examination results, as well as the progress made from each adjustment. Our friendly, helpful team is ready to assist you on your journey to better health. Improving lives one spine at a time. Schedule your time today!